Just as the community of St. Davids took its name from an individual, as explained in last week’s column, so also did the community of Wayne. The stories, however, concern two people widely separated by time and circumstance. 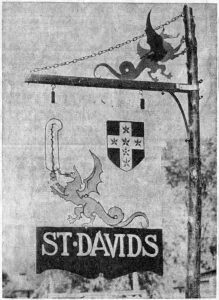 St. David, the patron saint of Wales for whom a Cathedral City in that country was named, was born in the early part of the seventeenth century, while “Mad” Anthony Wayne, one of the heroes of the American Revolution, was born in Easttown township on January 1, 1745. His old home, “Waynesborough”, still stands by the side of the road near Paoli, a stately house built by General Wayne’s grandfather in 1724, and still occupied by a descendant of the family. 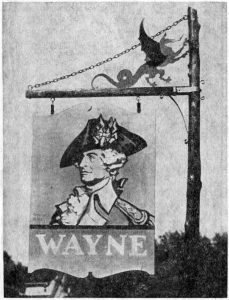 As we look at the handsome and dashing general, as pictured in the first roadside sign illustrating today’s column, we can readily agree with Amy Oakey when she says in her recent book, “Our Pennsylvania”, that, after all, “Mad” Anthony Wayne’s “madness consisted of fearlessness”. Every act of his long public career justifies that statement. The defeat of the Continental forces at Chadds Ford in the Battle of the Brandywine only gave him fresh courage to go on to Stony Point, where, on the night of July 15, 1779, he achieved the most brilliant victory of the Revolutionary War. 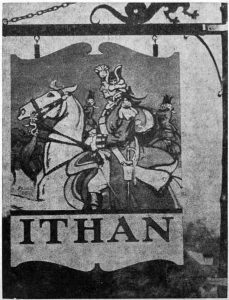 The second picture in today’s column shows Anthony Wayne on horseback as he led his troops at Chadds Ford. 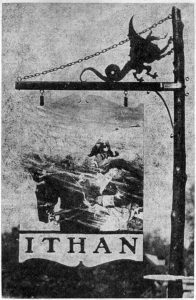 The two signs were designed and painted by Arthur Edrop. Wayne’s private career as a farmer in Chester County, after his marriage to Polly Penrose in 1767, was a short-lived one. When small Margaretta was six years old and Isaac three, their father was elected to the Pennsylvania Convention and Legislature, serving on the Committee of Safety. But his activities in Philadelphia were not long-lived, either. In 1775 he raised a regiment, with which he took part in a campaign against Canada. Although he was wounded at the Battle of Trois Rivieres, in January, 1776, he soon went on to the command of Ticonderoga and Mt. Independence. By September he was made a Brigadier General and had a Division at the disastrous Battle of the Brandywine at Chadds Ford. The following month he commanded the right wing at the Battle of Germantown. For his part in the great victory at Stony Point, Wayne received a Congressional Gold Medal. Later highlights of his career were the bayonet charge by which he rescued Lafayette in Virginia in 1782 and his daring attack on the British Army at Green Springs later in the same year. Once he had done his share in winning the Revolutionary War, Anthony Wayne retired quietly to his Chester County farm, but it was not for long. Soon he was summoned by General Washington to take care of counter-attacks against the Indians in their frontier raids. And so, in June, 1792, Wayne moved westward to Pittsburgh and then proceeded to organize the army which was to be the ultimate arbitrator between the Americans and the Indian confederations. The years of border warfare that led up to the Treaty of Greenville were full of hardships for both Americans and Indians. Before the treaty was fully concluded General Wayne died on December 15, 1796, in Erie, as a consequence of severe leg wounds. His mission, however, had been fully accomplished. 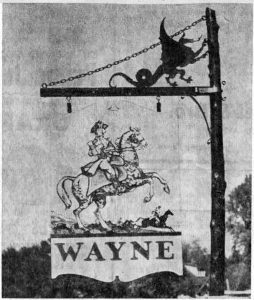 In erecting their roadside markers in December, 1935, the Wayne Committee for Civic Progress gave outward expression to their pride and that of the community in the man for whom Wayne was named. Perhaps too, they expressed their satisfaction in the foresight of the generation that, discarding the earlier and less significant names of “Cleaver’s Landing” and “Louella”, finally chose the one that commemorates the name and fame of one of the greatest of Revolutionary War soldiers. 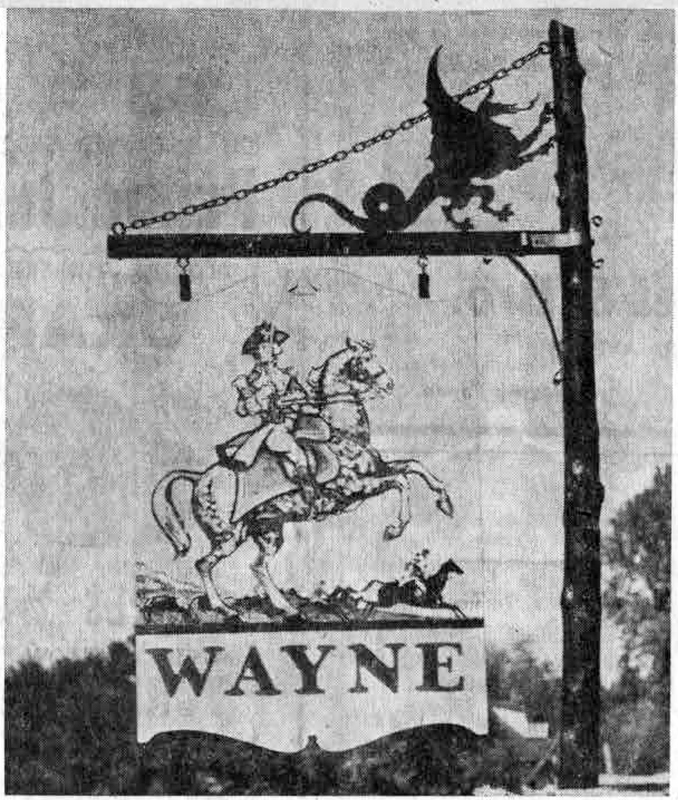 The roadside signs shown in today’s column are two of the eight presented to Radnor township by the Wayne Committee for Civic Progress in December, 1935. Both were hung on standards on the Lancaster highways and marked the boundaries of St. Davids, just as the two shown in last week’s column marked the boundaries of the settlement of Ithan, along Conestoga road. As stated in last week’s column, all eight were from designs made by Arthur Edrop. The two shown today were painted by Wayne Martin, at that time an art instructor in Radnor High School. 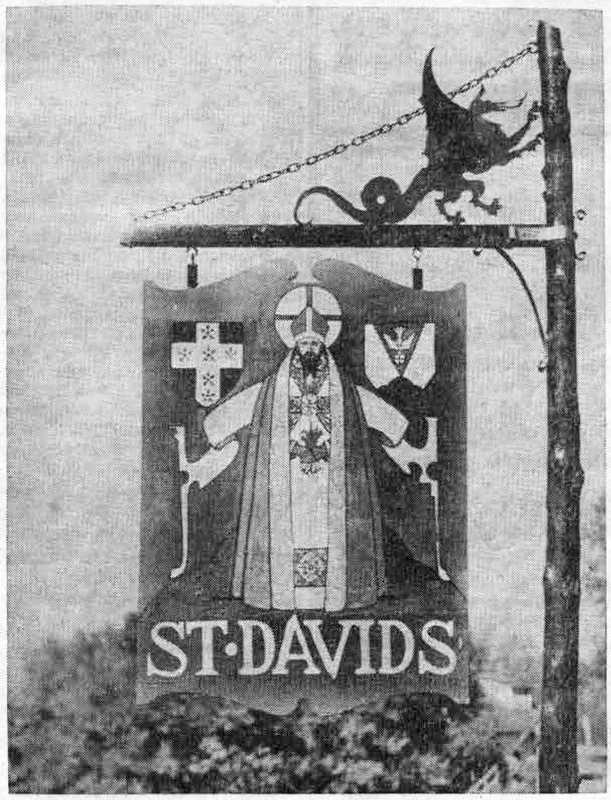 Since Radnor Township was originally a Welsh settlement, it is natural that the name of the patron saint of Wales should be perpetuated in the community, notably in the little Episcopalian Church, “Old St. David’s”, founded very early in the 18th century, and also in the community of St. Davids, lying to the east of Wayne. Separate in name only, the two form a continuous whole, with Pembroke avenue as it runs north and south at right angles to Lancaster Pike, a boundary line that is perhaps not generally known. Most impressive, indeed, is our good patron saint as he is shown in all the glory of his ecclesiastical robes, with his personal coat of arms and the device of the Seal of St. David. Even in pre-Christian times this general locality seems to have been an important one, being on the route frequented by pre-historic traders from the Mediterranean to Ireland. As their small boats were driven hither and thither by the wind and the tide, they had their alternate landing places along the coast of Wales. The encyclopedia continues its account by saying that “the pre-Christian tradition was continued by the Celtic saints moving between Ireland and Wales… The little landing places on the shore now had Christian chapels, where prayers were possibly said for safe voyages. At a focus behind a group of these small ports, in the quiet, sheltered, well watered valley of the Alun, the fine cathedral of SS. David and Andrew was built. Throughout the middle ages the cathedral was the center of pilgrimages. Two pilgrimages to St. David’s were popularly thought to equal one to Rome itself.” This old cathedral was restored in 1862-78, and is now the most important and interesting church in Wales. And so, deep-seated in history is the origin of the name of one of the oldest churches in Radnor township, and of one of its smaller, but still important communities. Our second illustration, according to its originator, Arthur Edrop, is “an heraldic arrangement, including the name of St. Davids in Wales and the Welsh dragon holding an ostrich feather, as he did on the shield of Arthur Tudor, Welsh prince”. This same decorative dragon is repeated atop the bar of oak which protrudes at right angles from each of the eight posts of red cedar which support the highway signs. As their contribution to the project, the Edward G. Budd Manufacturing Company, of Philadelphia, cut these dragons from “Everdue”, which was donated by the American Brass Company. A little more than two years elapsed between the organizational meeting of the Wayne Committee on Civic Improvement, held on November 1, 1933, and the formal presentation of the roadside markers to Radnor township, a ceremony held on Saturday, December 14, 1935. But these two years were not idle ones for the Committee. For one thing, their original ranks were augmented by representatives from several Township organizations not on the first roster. In addition, the original sponsoring groups added to their representation, increasing the total of active members on the committee. Besides those named in last week’s column, the American Legion Auxiliary added Miss Margaret Cornog to the list, while the Neighborhood League did the same with Adolph G. Rosengarten, Jr. Matthew Randall joined the original three for the North Wayne Protective Association, as did Dr. A.J. Culver for the Wayne Public Safety Association. The Wayne Art Center, the originator of the project, added Dr. Addison S. Buck and Frederick Richardson to its representation. Mrs. W.N. Stilwell became the second member from the Saturday Club. Three other groups showed their interest in the proposed objectives of the Committee by sending representatives to the meetings. These included Mrs. Edward W. Higgens and Mrs. E. Bisbee Warner from the Musical Coterie; George L. Harrison from the Wayne Library and A.A.H. de Canizares and M. Lester Vail from the Wayne Chamber of Commerce, and finally there were three members at large, Joseph M. Fronefield, 3d, Frank Paul Kane and Horace B. Montgomery, Jr. 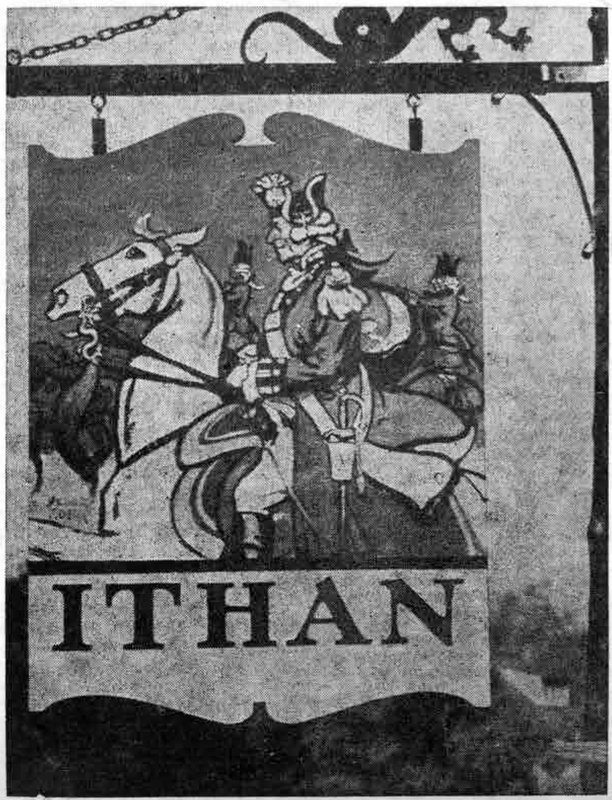 These were the men and women who met together, during a period of several years, to discuss how the organizations they represented might cooperate in beautifying Radnor township, in particular its business district, which all felt compared disadvantageously with the residential districts. Not all that they attempted to initiate was accomplished. But as time went on, their first ideas met by Arthur Edrop, a resident of Radnor, who is well known as an illustrator thoroughly conversant with military uniforms and accoutrements of many countries, and of many periods of history. From these designs Wayne Martin, former art instructor at Radnor High School, painted the two signs which hung in the St. Davids section, while Mr. Edrop painted the remaining six. “Though each one of the signs”, according to Mr. Edrop’s account, “has a different inspiration, the entire eight are similar in shape and are swung from a uniform set of red cedar posts. “These have been designed by Herbert S. Henderson, an engineer and artist. Each is topped by an heraldic Welsh dragon. This engaging reptile proclaims that the original settlement of Radnor township, as well as much of the rest of the Main Line Section, was made by the men of Cambria, on land purchased by one Richard Davies from William Penn in 1681”, said Mr. Edrop. Mr. Henderson is still a resident of Wayne, and now lives on Brookside avenue. The first picture in today’s column shows a jolly British officer taking his exercise on a gray steed, while in a coach in the background rides a belle of the period, and attended by coachman and footman. This picture is entitled “Colonial Days”. The second picture is of a more serious type, showing a Continental officer, mounted on a bay charger, against a background of troops and Conestoga wagons, all half hidden by a swirling snow-storm. Its title “On to winter quarters at Valley Forge” is particularly interesting, in view of the re-dedication in June, 1950, of an old stone marker commemorating the march of the American army under General Washington along Conestoga road, following the Basttle of the Brandywine. Legend has it that it was on the last day of Washington’s march to Valley Forge in December, 1777, that he passed along Old Conestoga road. Legend also has it that the last night of the encampment of his troops along the way was spent in the meadow near where the present overpass of the Philadelphia and Western Railroad crosses Conestoga road.